Sheep 201: Why do you want to raise or keep sheep? There are many reasons to raise sheep. The reason(s) are important, as they will have a significant impact on the breed(s) that are raised and the manner in which the sheep are fed, managed, and marketed. Traditionally, sheep have been raised on farms and ranches for the purpose of generating an income for the farm and family. 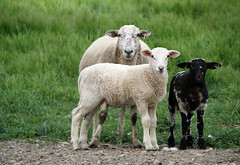 While some farms make a majority of their income from raising sheep, sheep production is very often a secondary or tertiary enterprise on a farm. In fact, sheep raising compliments many other agricultural enterprises. It is a popular enterprise for many part-time and lifestyle farmers. Sheep production is a good activity for youth. There can be numerous tax advantages to raising sheep or engaging in similar agricultural activities. Some people raise sheep for the primary purpose of having their land holdings taxed at (lower) agricultural rates. The legal definition of a farm (for real estate tax purposes) varies by state and country. While all agricultural enterprises are expected to eventually generate a profit and pay taxes, many people raise sheep (and other livestock) as a "tax write-off." Farm expenditures, including capital purchases, can be written off against ordinary income. Most sheep-related purchases are exempt from sales tax. Some people keep sheep to improve and/or maintain their landscapes. Due to their small size, upland grazing preferences, and desire for a varied diet, sheep are ideal for vegetation control, especially where the primary vegetation is grass and forbs. Their small hooves minimize soil compaction and erosion. They shy away from fragile riparian areas. Many families enjoy the rural lifestyle and wish to expose their children to plant cultivation, animal husbandry, and other aspects of agricultural production. 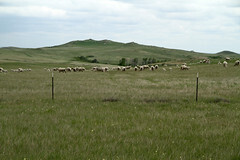 Sheep are an ideal small farm (or ranch) enterprise. Because of their small size and gentle nature, sheep are especially suitable for women, children, and people with certain disabilities. 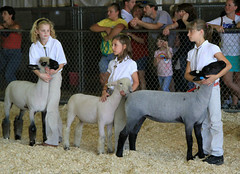 Showing (or exhibiting) sheep can be an enjoyable activity for people of all ages, but especially youth. Sheep and lambs make excellent 4-H and FFA projects. In fact, 4-H and FFA is how many people get started in the sheep business. Sheep are suitable projects for home schoolers. Many of life's lessons can be taught on the farm. There are many science fair projects that can be done with sheep and wool. There is a certain satisfaction to growing your own food and fiber. Many people keep a few sheep to provide meat, dairy products, and/or fiber for their family. 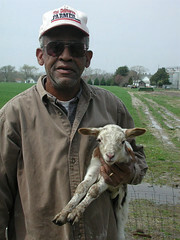 Small flock owners contribute to the supply of local food and fiber. Some people wish to support livestock conservation efforts by raising and helping to preserve a rare or heritage breed of sheep. Many people raise sheep because of their desire to train and trial herding dogs, usually Border Collies. It is hard to train and work a herding dog without having access to a flock of sheep. Hair sheep are usually kept for this task, as they are more tolerant of the heat and rigorous workouts. 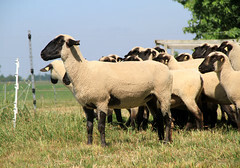 Wethers are often preferred because they can be worked on a year-round basis. 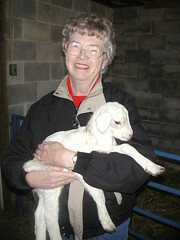 Sheep raising can be an enjoyable activity for retired or disabled persons. Sheep are easier to handle than larger livestock and the investment in breeding stock, equipment, and facilities is usually much less. In some situations, the sheep enterprise can supplement the retirement income. Empty-nesters and single people may keep sheep so they have something to care for. Increasingly, people are keeping sheep (and other farm animals) as pets or companions. Wethers and ewes should be chosen for this purpose. Intact males and horned animals should not be kept as pets. Hair sheep are a good choice because they do not require shearing. They are also more resistant to internal parasites (worms). Bottle babies make the best pets because they will naturally bond to whoever feeds them. Sheep are social animals. Pet sheep should be kept in pairs or small flocks (ideally). The love of sheep and animal husbandry is the motivation for many shepherds, both commercial producers and lifestyle farmers. In fact, if you don't genuinely like sheep, there are a lot easier ways to make money or spend your leisure time. Once you have decided to raise sheep and have defined your reason (or reasons) for raising them, it's time to set goals for the sheep operation, especially if it is a commercial undertaking. Goal-setting includes determining which aspect(s) of sheep production -- meat, fiber, or dairy-- will be the focus of the operation, what products will be sold, how they will be sold, and who will be the primary customer(s). It is a good idea to have a business plan. Success - a favorable outcome; accomplishing what was proposed; an event that accomplishes its intended purpose; the achievement of one's aim or goal; financial profitability. Success will be defined differently by different sheep owners. For the commercial producer, success will likely be to make a financial profit and return on investment, though the farm may have additional goals that pertain to quality-of-life and stewardship of their farm. Winning shows or selling expensive breeding stock or club lambs may define success for some producers. For performance-minded seedstock producers, having the ram that ranks the highest in the breed's sire summary or has the best EBV (estimated breeding value) for a specific trait may be the mark of success. Some producers will measure success by achieving certain production goals. Marketing a 200 percent lamb crop would be a worthy accomplishment for most producers. Not losing a single lamb during the lambing season may be a goal of some small-scale producers. Keeping pre-weaning death loss below 5 percent would be good accomplishment for large commercial growers. Raising thoughtful, responsible children who have a healthy respect for animals and the environment could define success for the many families that undertake sheep raising as a 4-H, FFA, or home school project. 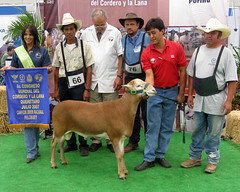 Livestock production is an excellent way to enhance a child's science education and encourage science-related careers. It is also a way to encourage entrepreneurship. Late updated 07-Nov-2017 by Susan Schoenian.